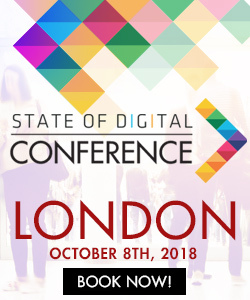 The Wolfgang E-Commerce KPI report was first published in 2015 as a response to a key issue many digital marketers were facing; how to make sense of the daily deluge of data. In 2018, the measurement issue has evolved. Marketers are now very proficient at digesting large quantities of data and extracting insights. The issue facing most marketers has swung from deluge to darkness, and in particular, darkness around social media performance. In response to these evolving questions, we’ve expanded the study beyond Google Analytics to include Facebook’s brand spanking new Analytics platform. When neither platform could provide us with the answers we craved we went direct to the horse’s mouth via online surveys. The result is our most far-reaching and most insightful e-commerce report yet. We believe it’s the first to shine a light on commercial elements of ‘dark social’ and in doing so is the first to release a number of insights globally. Before I get into our Social findings I must state that Google still makes the World Wide Web go ‘round generating 60% of website traffic and 56% of website revenue. In 2018 however, there is a huge chunk of action happening between brands and their audiences online, but off-site. Let’s dive into that. The age-old question “What’s a Like worth?” now has an answer. A Like is worth 3% of your average order value (AOV)! Thanks to the new Facebook Analytics we can now put cold, hard commercial metrics on social media engagements. 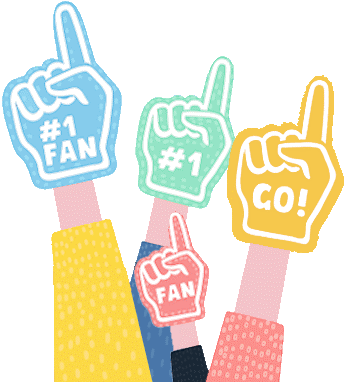 When we averaged out our Facebook Analytics data we found that 3% of the people who Like your content will go ahead and purchase from you. The conversion rate increases to 4% for a Share, 4.67% for a Reaction, 4.9% for a Comment and if the user takes the time to message you it’s a whopper 9.95% conversion rate. The unseen currency of time is crucial here. As the user commits increasing time and effort, conversion rate increases. Messenger a click and more text. The old adage ‘Time = Money’ holds true for social engagements. 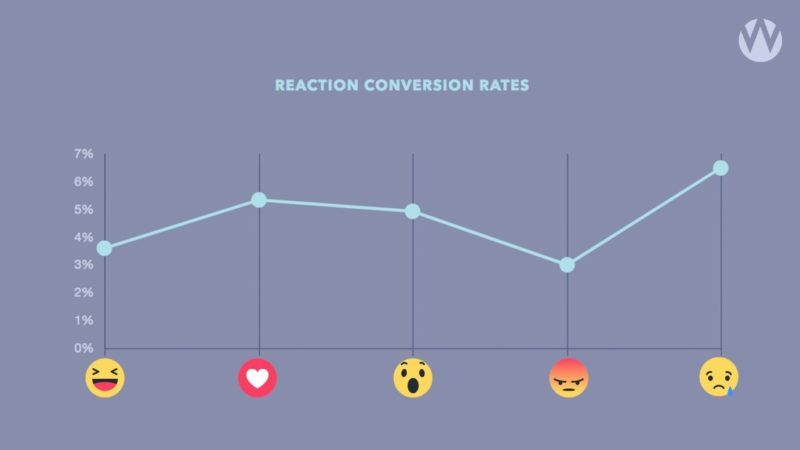 With regard to Reactions, it seems the stronger the emotion, the more likely that person is to convert. 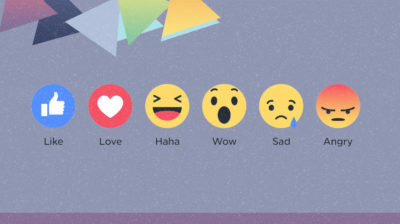 This means it’s the mission of the social media marketer to make their audience feel intense emotions… good or bad. Perhaps, the stand out conversion rate for ‘sad’ indicates the social media user’s predication for retail therapy! 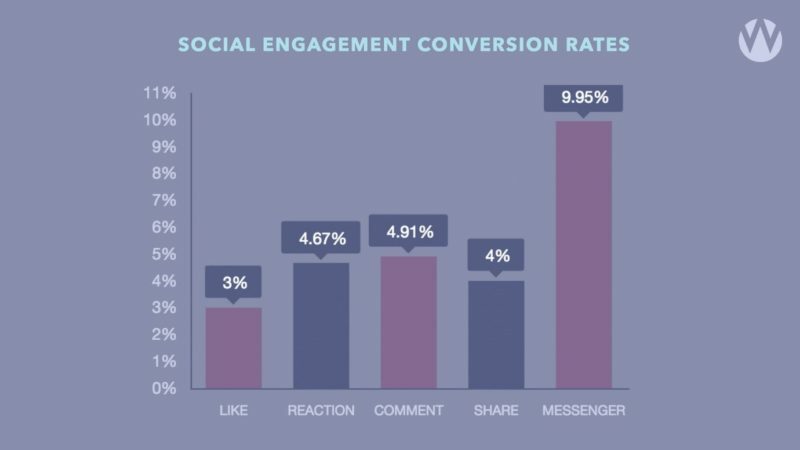 Here we can see that the average conversion rate for a Facebook engager (Like, Reaction, Comment, Share) is double that of the website conversion rate. 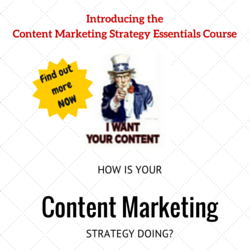 So, we can infer that a social engagement is twice as valuable as a website visit! 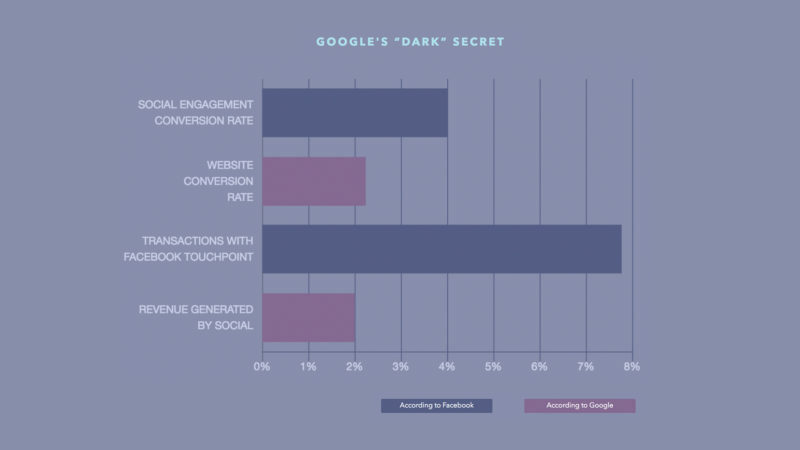 In addition, Facebook’s ‘any-click view’ of conversion claims a touchpoint on 8% of transactions, while Google Analytics’ ‘last-click view’ allocates just 2% of revenue to social traffic as a whole. This four-fold swing in conversion between Google and Facebook reporting highlights the difficulty digital marketers face in getting a singular view on performance. The marketing value of the interaction doesn’t end with the engager alone. Facebook offers an advocacy advantage via the Share. Numerous reports, including Nielsen’s Global Trust in Advertising report, have asserted that a message about your company that comes through your customers to their friends and family is far more impactful than anything you can say about yourself. We asked a panel of 300 internet users about their attitudes to the Share. 66% said they noticed a friend/family interact with a brand on social media in the last 24 hours. 62% said they are more likely to interact with a brand they saw a friend/family member interact with. 58% are more likely to trust a brand they saw a friend/family interact with. 48% are more likely to buy from a brand they saw a friend/family member interact with. These responses are an overwhelming illustration of Facebook’s advocacy advantage and although trust in Facebook as a company is at an all-time low it is still a devastatingly effective platform to use to generate brand trust via its users. You can expect shares on Twitter, LinkedIn and other social networks to be as valuable if not as scale-able. These are a small sample of the findings from the Wolfgang E-Commerce KPI Report 2019. You can read the complete study here. Wolfgang Digital is an award-winning International performance agency based in Dublin, Ireland.